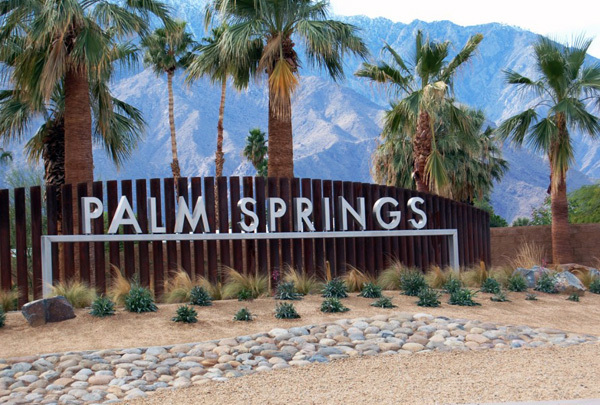 The Los Compadres Neighborhood is one of the 43 officially recognized Organized Neighborhoods of Palm Springs (ONE-PS). To support the growth of the LCNO and enable us to offer more programs in the neighborhood, please consider making a donation. to read or download the LCNO newsletters. Palm Springs Plastic Bag Ban went into full effect on May 3rd, 2015. In support of this effort, LCNO has insulated grocery bags (see above) for sale - $10 each. If you are interested in purchasing a bag(s), please contact us at info@lcno.org or join us at an LCNO event. 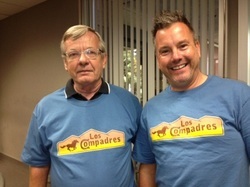 Sporting LCNO T-Shirts are Board Members Philip Strout & Jeffery Holley at a One-PS Monthly Meeting. Do you want an LCNO T-shirt or polo shirt? We still have about 10 XL limited edition t-shirts available for $10 each and several polo shirts of varying sizes for $25. The Board of Advisors meets on the second Tuesday of every month at 6:00 pm at a Demuth Park Community Center. All meetings of the LCNO Board of Advisors are open to the public. Please e-mail us at info@lcno.org if you would like to confirm a meeting date. Anyone interested in helping us grow the LCNO, should attend a meeting. All residents of the Los Compadres area are encouraged to attend and participate. The LCNO has a thriving and growing group on Nextdoor, the free and private social network for neighborhoods. To keep up with our activities, events, area and neighborhood information, register at www.nextdoor.com by entering your email address and street address. It's fast and easy to join. "90% of earthquake survivors are saved by other survivors"
The LCNO (and adjacent SSNO) have adopted Emergency Preparedness as a major issue. Several of the current LCNO Board members have taken the CERT training and are bringing this important information to our neighbors through workshops and continuing preparedness activities. Click Here for Materials from the Last Workshop. Please check back for the next CERT training or LCNO Preparedness Workshop dates. In 2005, the City Council formalized a process for officially recognizing neighborhood organizations throughout Palm Springs. City officials have increased opportunities for citizen involvement and built strong partnerships between City Hall and the community through these recognized neighborhood organizations.